God gave us all a sense of humor to cope with life’s travails, and boy does Tevye, the lead character in Fiddler on the Roof, need it. 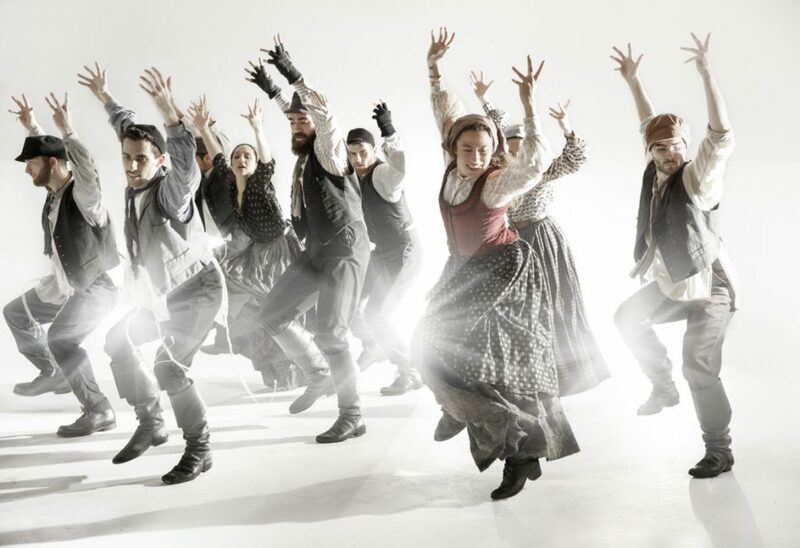 His troubles are portrayed both comically and movingly in the new North American touring production of Fiddler, at Benedum Center through November 25. In case you are not familiar with the story line of this long-beloved musical: Tevye is a struggling dairyman who delivers his milk and cheese to his neighbors in the poor Jewish shtetl of Anatevka, in the Pale of Settlement in Ukraine. His horse has a bad leg and now Tevye has to pull his own delivery cart. He lives with wife Golde and their five daughters in a small farmhouse. They cling to life precariously, like, he says, a fiddler on a roof. Tevye is also encountering changing times. Long-held traditions and beliefs are being challenged and anti-government sentiment is on the rise. Tevye sings about the importance of the way things have always been done in the song “Tradition.” He sings that we have traditions and must uphold traditions, but no one really knows how the traditions began. The Tevye role is played brilliantly in this production by the Israeli actor Yehezkel Lazarov. It helps that Lazarov has such a well-written and rich character in Tevye. However, Lazarov has a great acting and singing range. His physical humor shows a range reflective of the mania of a John Belushi to the calm, humorous observations of Will Rogers. He lumbers around the stage sometimes like Milos the tennis pro from an episode of “Seinfeld.” When he sings his voice runs the gamut from operatic highs to quieter melodies. Golde (Maite Uzal) is Tevye’s wife and a stern and obedient woman who is also bound to traditions. One such tradition is that of using a matchmaker to arrange marriages. That is how she and Teveye became married, and is the subject of a touching moment in the scene “Do You Love Me?”. Yente (Carol Beaugard), Anatevka’s matchmaker, stops by the house to talk with Golde about an older, widower butcher who has an eye for their oldest daughter. The butcher, Lazar Wolf (Jonathan von Mering), is a man of means and would be a good provider for eldest daughter, Tzeitel (Mel Weyn). The only problem is that Tzeitel doesn’t want to marry him; she is in love with the poor tailor, Motel (Jesse Weil). This sets off a chain reaction crisis of events in which the two next-eldest daughters, Hodel (Ruthy Froch) and Chava (Natalie Powers), have their own ideas about who they want to marry. The daughters sing a fun tune about matchmaking with “Matchmaker, Matchmaker,” which has the lyric: “Playing with matches/A girl can get burned.” One humorous match that Yente is trying to make is between a girl with bad eyesight and a less than good-looking boy. Golde is a cunning woman, and she sends Tevye to see the butcher, just telling him that Wolf wants to talk to him about something. Tevye has one subject of conversation in his mind while Wolf has another, which makes for an entertaining scene. The marriage agreement is confirmed which leads to a drinking, song and dance number, “To Life (L’Chaim! ),” at the village tavern. However, the next day a hungover Tevye hears a plea from Tzeitel and Motel that they love each other very much and want to marry. After much deliberation Tevye relents and allows it to happen, thus going back on his agreement with Wolf. To convince his wife to allow it he conjures up a frightful dream with Golde’s mother disavowing the matchmaker marriage. The dream scene is like a scary Nutcracker scene with the actors wearing hideous masks and having long rubbery fingers. The con works and Golde is in favor of Tzeitel and Motel marrying. Part of the wedding scene is mainly focused on Tevye and Golde who sing separately their feelings about their daughter, Tzeitel, getting married, then sing together in “Sunrise, Sunset.” Uzal has a fine singing voice too. 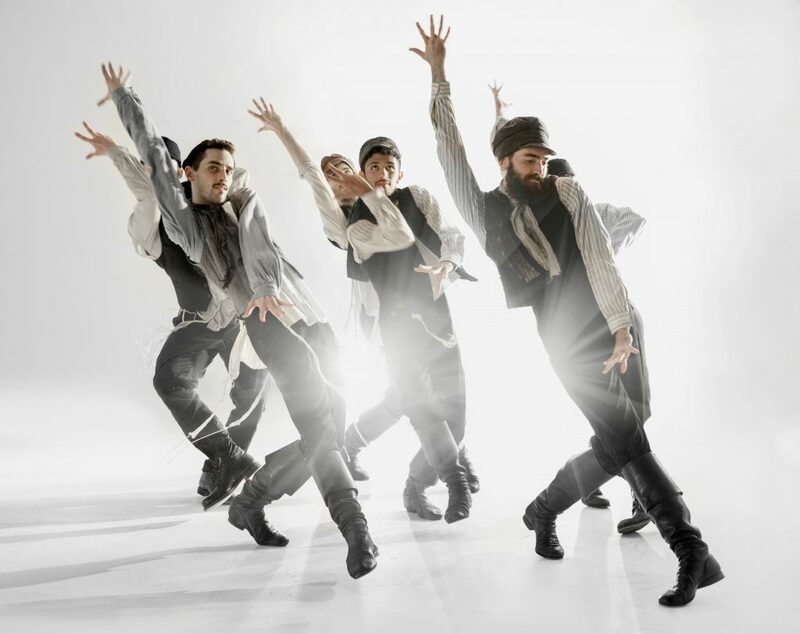 The dance ensemble numbers are quite spectacular, which is no surprise as the choreography, by Israeli dance artist Hofesh Shechter, is based on the original Broadway staging of Fiddler by the noted Jerome Robbins. It looks like this production has carried high-quality choreography through. An amazing dance sequence is during the wedding when four men dance with bottles of wine on their black hats. Also during the wedding scene, and in other parts of Fiddler, early glimpses of the fight for women’s rights appear in the male-dominated world of Orthodox Judaism. The musical score is very interesting too, part Yiddish and klezmer, part Broadway show tune. Apart from “Matchmaker” and “Rich Man,” some of the best musical moments are the quieter, tender ones. “Sabbath Prayer” is an insightful song. It is sung during the candle-lighting with Tevye, Golde and family all gathered around. In the background of the scene other families can be viewed gathered for the sabbath praying around lit candles. Another gripping scene and song is “Chavaleh (Little Bird)” sung by Tevye when he is struggling to understand the decision that Chava has made that is alienating her from the family. One of the most intensely staged scenes I have witnessed in a while is the “Anatevka” scene, which used strong lighting and partial silhouetting to great effect. Staging for Fiddler was simple and effective. During village scenes a backdrop of about eight houses hung from overhead in the background and was visually interesting. During the nighttime scenes there were lights in the houses. Costumes seemed representative of the period. The lighting was quite good as was the music by the orchestra. Both the lighting and music were also used skillfully to accentuate certain moments during the play. All of the cast did a fine job in their roles. The musical is set in 1905 when Ukraine is under the thumb of Russia’s Tsar Nicholas II. He is not very fond of the nation’s ethnic and religious minorities, especially the Jews. It is based on the “Tevye the Dairyman” stories written by Sholem Aleichem (1859-1916). A Yiddish author and playwright, Aleichem grew up in the Pale of Settlement and started his career there, but after witnessing the Tsar’s pogroms he left the country, living in Geneva, Switzerland and ultimately in New York City. Fiddler on the Roof had short tryout runs in Detroit and Washington, D.C., and opened on Broadway in September of 1964. The production was nominated for ten Tony Awards, winning nine including Best Musical. In 1972 it set a record for longest-running Broadway musical. Much like the historical record of the Jewish people, Fiddler has humor and celebrations, but also darker parts too. It is a story that is relatable to other people, races, and time periods. Fiddler is not a formulaic musical. This Fiddler on the Roof is a very well done production and one that deserves to be seen. Fiddler on the Roof, adapted from the stories of Sholem Aleichem, has music by Jerry Bock, lyrics by Sheldon Harnick, and book by Joseph Stein. The North American touring production is directed by Bartlett Sher. It is presented here as part of the Pittsburgh Cultural Trusts’ PNC Broadway in Pittsburgh series. Through November 25—including an evening performance on Thanksgiving—at Benedum Center, 237 7th St., Cultural District. For showtimes and tickets, visit the Trust Arts web page for the show or call 412-456-4800. Photos courtesy of the Pittsburgh Cultural Trust and Broadway Across America. Rick Handler is executive producer of Entertainment Central.